If you’ve been following my blog, you have no doubt read that I’m currently looking at hats. My last post detailed the first eBay hat that came in. I’m still working with that one, but it may prove to be a lost cause. We shall see. My son thought it was funny when I put a couple of his plush toys on my head. It did fit above my ears, but I was likely to knock doorways with the top of that crown. It totally felt like I was wearing an Arby’s hat. Instinct‘s wife, Intuition said that I need ‘supervision’ when I’m shopping for hats. As far as how I’m wearing it in that picture is concerned, it was cold and blustery, and the hat was pretty warm pulled that low. In my back yard, it’s not like anybody was going to see me like that – unless some weirdo posted the pic on the interwebtron or something, right? As an aside, nice blizzard, eh? FYI – the coat and gloves are actually black. Jenni said that she would bead a new band for it, and I may try tooling a leather hat band or two. I’m trying to decide whether I need to completely cease online hat purchasing or if I have learned anything from my isolated yet dismal success rate. The savings can be quite significant, as I didn’t pay nearly as much as I should have for either hat. That in and of itself may be enough motivation to keep going like I am. In any case, please do let me know what you think about it! came in the mail a couple of days ago. It was unceremoniously shoved into an undersized USPS box and delivered to me at work. The brim was a little misshapen and the top of the crown was popped in. The crown easily popped back into shape. I tried it on, and my adjacent coworker said, “Well hello, Jeb.” Not to be discouraged, I took the hat home and decided to try my hand at reshaping the brim. The way I looked at it, it was already screwed up and if I screwed it up worse, I could then take it to a professional. Last night, I put the tea kettle on the stove and worked up some steam. I carefully steamed the brim, a little at a time, and sculpted the kinks out of the brim and then reshaped it more to my own style. I’m not sure what’s up with the face I’m making there. It kind of looks like I’m about to sneeze. As for the hat brim – not bad for an amateur attempt! Still, there’s something about it that doesn’t look quite right. I wore it to work today, and a different coworker caught me in the shop and declared, “Your other hat looks better on you.” You’ve got to love people that have no filter! I’m not really sure what to think at this point. I’ve gotten nothing but compliments on my wool hat, but I’ve gotten very mixed reactions on this one. I kind of wonder if the crown is a little too wide to look right on me. One of the challenges of having a head sized like mine atop my five-and-a-half-foot stature is that a subtle hat shaping issue could tend to make my head look really big. So, please tell me what you think. Jenni pointed me to this rant by Stingray at Atomic Nerds about the commercialization of Christmas. It seems that at about this point, nearly every year, I find myself making an empty vow that I will never participate in commercial Christmas again. I pretty much hate trying like mad to find that special something for each and every person on my list. Most of the time I’ll find an item here or there that’s a no-brainer for someone in particular, and then when we’re getting down to the line, I’ll desperately throw my hard-earned money at some other stuff that will do so no one will feel left out. It’s psychotic! And yet, I know that I’m not alone. Lots and lots of people do the very same thing. Year after year, I claim to myself that I will never do it again, and year after year, I do the very same thing all over again. Our household is basically on a spending freeze until after the first of the year. What was supposed to be a really cool gunnie Christmas has turned into a frantic run to empty assets as quickly as possible. I don’t care what you say, Stingray, I still believe in God, Christmas and the Christmas Spirit. I feel the same way you do about the commercialization of Christmas, which is why I don’t buy into any of it. I went to Catholic school and became so disillusioned by all the hypocrisy that I became, not only an atheist, but an anti-God bonehead. Throughout the years of personal strife, I came to let God back into my heart and at once, I felt inner peace that I had never felt before. I don’t believe in organized religion by any means, but God is always and forever and will always be my saviour. And, that’s one of the many things I like about him. I’ve tried on several occasions to bully him into starting up his own blog, but he apparently is not to be bullied into such things. He makes so many excellent points in his comment that I can’t really touch on all of them. for one, I’m not about to get started on my atheist rant right now. But, words like these convict me that I have lost sight of what the celebration is really about. It’s not about getting a shiny new gun, or fancy electronics, or boots or hats, or a tacky tie. It’s not about spending my hard-earned cash on some piece of crap that the receiver won’t even like, nor is it about finding that perfect present that a loved one will cherish forever. At the risk of sounding like a Hallmark special, what is Christmas really about? Most biblical scholars agree that Christ was not, in fact born on December 25. In Rome, December 25 was the pagan celebration of the Winter solstice, a time of wild partying, since the sun was not in fact going to disappear forever, yet again for another year. Early Christians adopted this date, as the ambient celebration would mask their risky, religious holiday. Christians were not well-liked at the time, and open celebration could get them thrown to the lions. Ironically, many historians agree that Jesus was born on September 11, 3 B.C. The ‘wise men’ or ‘magi’ traveled from the far East to see the King of Kings who had be prophesied. These magicians were astronomers and astrologers. Something was lost in the English translations, referring to the star that they followed, as the original text refers to a cosmic event of some sort. We make a distinctions between different bodies in the heavens, and events in the sky. The textual reference to the star that they followed may have been more general than our language can allow, and actually referred to a conjunction between the moon and the constellation Virgo, in a form that has only ever happened once. It was a symbolic conjunction that told these ‘wise men’ that a virgin was giving birth to the Savior. They were able to calculate when the conjunction would occur and where it would be most visible from on the globe. This told them exactly where Christ was born. If this is true, the same conjunction is described in the book of Revelation. These visitors from the East bought three symbolic treasures with them. Gold represented the wealth of royalty and showed respect to Jesus as being the one true king. Frankincense represented the priesthood of Christ, as it was used in ceremony by the priestly class. Myrrh symbolized the fact that the child was born to die. Myrrh was used as a fragrant embalming agent, and is a resin, harvested by gashing the commiphora tree. It bleeds out of the gashes and is collected after it hardens. So, the magi from the orient knew exactly who they were coming to see – probably on a far deeper level than Mary and Joseph. Three hundred some-odd years later, a boy named Nicholas was born in the Greek city of Patara on the southern coast of Turkey. He was orphaned while relatively young, and his parents left him a fortune. As he grew, his religious convictions led him to use his wealth to the benefit of others. There are legends about his generosity of Robin Hood proportions. Multiple stories tell of him throwing bags of gold through the open windows of the needy, landing in the shoes which were left by the fireplace to dry (hence stockings for gifts). Nicholas became Bishop of Myra and was known as the patron and protector of children. St. Nicholas spent time in prison because of his faith, and the anniversary of his death was celebrated for centuries on December 6. I’m not really sure how St. Nicholas got inducted into the whole Christmas celebration beyond the closeness of the dates of December 6 and 25. Fast forward a thousand years, give or take, and filter the holiday and traditions through Norse religion. Santa took on Thor characteristics and gained a ‘helper’ based on Thor’s greatest enemy, Loki. Thus was born a demon-like creature, Krampus, which means ‘claw’ in old German. So the lore went: The list was kept and checked twice. The nice children got treats from Santa. The naughty children got beaten and whipped by ‘Claws’, and were left with lumps of coal and switches. In Austria and other parts of Europe today, Krampus is highly celebrated in a tradition that’s like our Halloween – but for grown-ups to scare little kids – and with booze instead of candy – and everybody gets schnockered. Somehow, Krampus got left off the boat when Christmas came to the New World. Santa kept the ‘Claus’, but only in name. We grew up hearing about the jolly old elf who shook like a bowl full of jelly, who magically comes down the chimney perhaps due to Clement Clarke Moore or Henry Livingston… Then, Christmas became commercialized. Rudolph the Red-Nosed Reindeer and Frosty the Snowman inexplicably entered the holiday in the mid-century. Christmas was taken over by industry and hard sales. Even the Oklahoma City Zoo got in on the action to wheedle themselves into a hippopotamus. Now, so-called ‘Black Friday’ Christmas sales make up 20% of annual retail sales. Some say the Saturday before Christmas is even busier. This is not to mention Cyber Monday or the stragglers that run amok on Christmas Eve. The sheer amount of money that changes hands due to this holiday is mind-boggling. Public schools can no longer promote ‘Christmas,’ as it may offend those of other faiths. My child’s school has no ‘Christmas’ programs, but instead has ‘Seasonal’ programs where the kids will sing about snow (which doesn’t even happen often in this part of the country). The lights and signs in people’s lawns say ‘season’s greetings’ or ‘happy holidays’ instead of ‘merry Christmas. The poison known as political correctness has all but completely driven the reason out of the season. Christmas is regrettably no longer a Christian holiday. It has returned to the pagans in the worship of money and wordly goods, and the celebration of nothing more than going into debt. So, what is the true meaning of Christmas? Can we go all the way back and celebrate it as an unprecedented event that took place on the most significant 9/11 in the history of the Universe – that was even worth designing the history of the sky around? Is it about throwing sacks of gold through people’s windows, hoping you can score in a sock or a shoe? Is it about scaring the living crap out of little kids so they’ll do what their parents tell them to? Is it about spending every last penny you have, and then going into debt to benefit no other than industry in a gambling-addict-like craze? Or, can it be as simple as my friend, Wai put it? I would like to think so. Jenni and I were able to purchase some nice gifts for a few people. We don’t presume that it’s the reason for the holiday. We will spend time with friends and family, and we will remember God’s love and His gift to us. I believe that’s the reason for the season. If you are reading this, I hope you can see through the lights, plastic, and glaze and feel His love as well. Merry Christmas, everyone! Over the Summer, I sunburned my scalp on more than one occasion. As the weather has gotten colder this Fall and Winter, my head has been cold. I’m not in denial. I know why. My grandpa is getting close to 90, and I don’t think he’s ever had hair on the top of his head. I’ve seen pics of him in his twenties with a little crown of hair that connected his ears around the back of his head, with his bare dome sticking up out of the middle. I believe that I have more hair than my dad did when he was my age. So, I suppose I should count myself lucky. I’ve been keeping my hair short, as I feel like thinning hair looks better short than any other way it can be worn. I don’t see myself messing with plugs, rugs, or drugs; so it’s time to make some adjustments. I can no longer count on my hair to shade my scalp in the sun, or to keep my head warm in the cold. I’ve been shopping for hats. What do you think of this one? Just kidding! That was Halloween at work. My biggest challenge is that I’ve got one huge noggin! The average men’s hat size is 7-1/4, or 22-3/4-inches in circumference. In His infinite wisdom, God gave me a head is a full inch bigger in circumference, or a size 7-1/2. Most of the local shops don’t have a great selection over 7-3/8. Still, some of the local shops do carry quite a bit in my size, I’ve done some online shopping, and there’s always the option of a custom hat (although expensive). I didn’t want to make a large investment and find that I couldn’t stand wearing a hat, so I started with a crushable wool fedora from Black Creek that I found at a local western outlet for about fifteen bucks. It’s comfortable, it keeps my head warm, and I don’t mind claiming that it looks pretty good on me! Both of which I recently purchased on ebay. I’m afraid the band on the Stetson has to go. I won’t make a decision until I’ve seen it in person, but I’m just not sure that’s working for me. It will be nice to have a few hats so I can let them air out between wearings. In my searching, I did speak with a couple different full-custom hat makers. It appears that the going range for a full-custom is $300 to $900! Maybe I should forsake the holster business for hats! Jenni says that she could see getting me a high-end custom one day. I’m not convinced that it’s worth it to me. Even if I had that kind of disposable capital, I think I could find better ways to use it. Any way, I never really thought I would wind up a hat person, but I’m kind of liking it! I am vaguely aware that my son often watches this show on Cartoon Network or maybe Nick (I believe) called Avatar. I’m not one of those disconnected parents that sees the T. V. as the babysitter, and have watched this show with him on multiple occasions. It seems like an innocent enough fantasy story with nothing that I find terribly objectionable in it, but I find it so mind-numbingly boring that I couldn’t tell you who the characters are or anything that they’ve ever done. What I’m watching for is to make sure that some stranger isn’t filling my kid’s head with crap that he doesn’t need. I heard somewhere that they were making a live-action, silver-screen, feature-length version of this show, and I know that he’s going to want to see it. Then, I started hearing these rumors about Avatar hitting the theaters this weekend. “Great,” I thought, “Let’s take kiddo to a matinee on Saturday and check out this little flick. So, I looked into it a little. So, what’s with the blue people? I don’t remember much about the show, but I don’t remember blue people. the chick looks pretty hot, if you can get over the weird eyes. Actually, that’s kind of… Wait a minute! Marines? I don’t remember Marines being in the cartoon, much less the central characters. Where’s the munchkin with the arrow tat on his gourd? I’m not sure this is the same movie that I’m thinking of at all! My lovely wife then explained to me that I was confused. It’s James Cameron’s political propaganda picture Avatar that’s coming out on 12/18/09, which has absolutely noting to do with the cartoon that I don’t really remember. She explained that the movie that I was thinking of is The Last Airbender coming out this Summer. Airbender? Really? I thought the show was called “Avatar.” I had pizza last night and have been bending air all morning. Does that count? Still, that looks a whole lot more like I think it should. Apparently, I’m not the only one that thinks this is a little confusing. This is just too weird. When they come out with the live action version of Ghost in the Shell, will they name it “Innocence” due to a copyright technicality? Will there be some random pile of special effects and heavily-weighted agenda message coming out half a year earlier that steals the title by legal technicalities? What about Cowboy Bebop? Is there nothing sacred in Hollyweird anymore? Huh. I guess I just answered my own question. On that note, let’s watch a Cowboy Bebop teaser! I REALLY hope they don’t F this one up. Last week I wrote about the horrid, pizza-pocket-ish things that I have in the freezer at work. There is but one of these things left, and I can’t bring myself to eat it today. If I weren’t so cheap, I would have pitched the whole box a long time ago. I don’t know exactly how many came in the box, but it feels like a zillion. I did eat one yesterday, and here’s the funny part: We had pizza for dinner last night. These microwavable lunches are so un-pizza-like that they don’t even make me not want pizza. I’m sorry, but that’s just weird. So here I am, not eating lunch yet again. Meh. Sometimes we set up at the North end of the field and shoot South. Other times, we’ll reverse that. There’s plenty of room to set up multiple targets for different drills, we’ve shot clays there, and there’s a decent enough stretch for rifle target shooting. Now, I’m making myself want to go right now! Next year, I fully expect to shoot a deer or two in that very place. But, I digress. It was apparently not meant to be. There was the $360.00 incident with the cat’s tail, and several other (albeit smaller), unexpected expenses that I won’t bore you with that simply busted our budget. Don’t get me wrong – it’s not a bad thing, but still a disappointment. Kiddo will get an air rifle, but it will probably have to wait until his birthday. I think we’re going to get him a new bike for Christmas instead. They’re quite a bit cheaper. As for the two of us, we’ll get each other smaller, simpler presents for now, and maybe we can get each other the romantic gifts of firearms for Valentine’s Day or something. I’ve been able to cite this disappointment as a valuable lesson to Kiddo concerning appropriate expression of disappointment, i. e. as upset as I was over the deal, I didn’t throw a fit. That’s been really good for his developing mind, and that in and of itself is worth more than a couple of new guns. Plus, it’s wonderful to be in a place in life were we aren’t living so beyond our means that we can’t deal with life’s little emergencies. There have been plenty of times that such financial demands would have put me straight into a panic. “How will we be able to buy groceries if the cat has to get stitches?” – and that sort of thing. Thank God, we aren’t there now! My employment status is kind of on a knife edge right now, but I’m only slightly worried about that. I know that I could quickly go back to work, and we have survived on far less than Jenni‘s current income in the past. Honestly, if I were really worried, I’d already have a different job by now. The fact of the matter is, although it wouldn’t be fun, the worst-case scenario is really not all that daunting. And, there are a lot of people that don’t have it nearly as good. As weird as it may sound, I’m actually thankful for the disappointment and the bumps in the road, as I’m glad that I got my lot in life as opposed to someone else’s. So, I guess that’s about it for now. Maybe I’ll take that last frozen pizza pocket thingy to the farm and shoot it. Kind of two birds with one stone, you know? I woke up this morning, and it was hard to get out of bed. Once we made it out of the house, it turned out the be a sweltering, 16-degrees F. Before getting in the shower, I weighed myself, buck naked. I weighed in at 145-lbs, just like normal. After donning my undergarments, clothing, guns, wallet, phone, and other gear, boots and coat, I weighed again. 165-lbs. Then, out of sheer, morbid curiosity, I grabbed my BOB and reweighed. 190-lbs. I had no idea that I was carrying around 45-pounds of stuff pretty much everywhere I go, on my person! The weather said that the high today is 27-degrees. Looking out the window, it doesn’t look nearly so cold. The sun is brightly shining, and that has to be the true deception. It’s clear and bright out there, but quite frigid. That’s why they can’t call it ‘Global Warming’ anymore. I don’t really remember the last time it was this cold, this early in the year. This Summer got unusually hot early, and then fizzled out for an early Fall. Perhaps this Winter will show a similar pattern, and we’ll be looking forward to an early start to Spring. I would like that. I really want to go and do some outdoor shooting, but I just don’t see that happening if we don’t get some more above-freezing days. I’d really like to get some paperwork done and jump through some legal hoops so I can shoot a deer next month. On that note, I’m going to go to Google and see if I can get signed up for a Hunter Safety Ed class. We shall see. …except that now that I read the schedule on the Wildlife Department website, I can clearly see that I have basically missed the season to shoot any of the tasty critters that I would like to until next year. Oh well. Can’t win them all. Last night, I made a lovely, Manhattan-style clam chowder. That is, I made a version of it, as it struck me to make it yesterday. The family ranted and raved about it, and I fully expect to make that recipe again. There was enough that we all had a good-sized bowl full, I had a second helping, and Jenni took what was left for lunch today. Although I love to cook delicacies for my friends and family, I’m simply too cheap to feed myself well for lunch. I bought a box of off-brand pizza pockets that I’ve been nursing for several weeks now (when I even bother to eat lunch). If I don’t nuke them for a full two minutes, they’re still cold in the middle. When they reach the two-minute mark, they vomit some of their filling out the ends. These things are so terrible that they can’t stand themselves! The crust is hard and dry at the edges, and tough and doughy in the middle. The filling is an unidentifiable, homogeneous mixture of something tomato-paste-like and something cheese-like. There are random globs of something that I choose to believe is sausage interspersed through this solution. And then, there is some kind of mystery grease that floats on top of the goo that remains nuclear hot even after everything else has cooled. This grease refuses to stay in the pocket, and erupts onto my fingers and chin like some kind of trans-fat volcano on a hellish, artificial food planet. Yummy. The really sad part is that it would be easy enough to deliberately make enough food in the evenings that there would be enough leftovers for both of us to take to work. And, I know that Jenni would gladly send the leftovers to work with me instead of taking them herself, but for whatever reason, I’d prefer that she got that, and I seem to stay perfectly happy eating my mystery pizza pockets. For a time, I made it a point to take myself out to lunch at least once a week. I’m just not one of those people that can do that every day. At six to eight bucks a plate, five days a week, fifty-two weeks a year, that comes out to $1,820.00! I simply refuse to pay eighteen-hundred dollars for lunch in a year! The one outing a week arrangement is way easier for me to justify. But, I’ve fallen out of that habit for some reason, and I’m really not sure why. I really should give some more thought to bringing leftovers. It would certainly be better than my cardboard pizza thingies. Just like clockwork, I fill up the gas tank on our car every five days. I have pushed it to six from time to time, but it seems that when I do that, I’m sweating over the tank light until I make it to the gas station. On the down side, the engine has an 11:1 compression ratio, and doesn’t run worth a crap on anything short of premuim. On the up-side, the tank only holds twelve gallons, and the car sips on that at an average of 26.5-mpg. Yesterday was the day in question when it was time to fill up. The station that I prefer to go to is near Jenni‘s office, but it’s kind of a rough corner. It’s not that I ever fully let my guard down – I’m just not the kind of person that ever takes it for granted that I’m ‘safe’, but I have my more relaxed moments and my more guarded moments. When I’m at this gas station in particular, I’m usually on high-alert, carefully observing everything happening around me. While I was filling the tank, I noted the other cars and drivers in the parking lot and at the pumps. It’s funny that the people I notice don’t necessarily seem to notice me there. I watched a silver Pontiac Vibe pull into the parking lot and up to the ‘FREE AIR’ compressor thingy. I watched as a mid-thirties, brunette girl stepped from the car, wearing a pair of khaki-colored pants and an unprinted, white T-shirt. This struck me as odd, since it was close to freezing, if not below. When she turned to close her door, I saw a full-sized, polymer semi-automatic in a belt holster on her right side. It appeared to be a S&W M&P or something similar. The magazine floor plate looked like the M&P’s anyway, but I was trying my very hardest not to stare. I glanced around the parking lot, and it was very clear that nobody else had noticed. I looked back in her direction, and she had turned so that I could only see her left side, and the gun was out of sight. For a fraction of a second, I wondered if I had imagined it – until she turned with the air hose in her hand and I caught a full view of the profile of her sidearm again. Once she was done airing up her tires, she pulled around to a gas pump and proceeded to fill up her tank. I left the gas station while she was doing this. When I picked up Jenni from her office, I told her about the whole experience. She said that it didn’t really surprise her, as she’s seen many people in that little part of town open carrying. She noted that they are usually young women alone, or people on motorcycles. Personally, I can fully understand why anyone on a bike, or without some kind of group support would want to be armed in this neighborhood. Honestly, that’s a big reason that I got my CCW permit – most places that I hang around are extremely safe, but I do pass through other areas that raise my red flags. Having said all that, public open carry is explicitly illegal in the State of Oklahoma. I know people do it, because I’ve seen people do it on multiple occasions. Working retail, I had a salty, old, regular customer who kept a nickled revolver on his hip at all times, and in plain sight. And then, I’ve had many experiences like the one yesterday, where I’ve witnessed an ununiformed individual openly packing heat. (Maybe that’s why she was down to her T-shirt in freezing temperatures! :-D) In any case, I have to wonder how people get away with it. You don’t just wander around, obviously breaking the law as a lifestyle and still not get caught. I could understand how someone might do it out of ignorance, but that would only last until the inevitable confrontation with law enforcement. Perhaps they know some kind of obscure, legal loophole that has so far evaded me? There has been a pretty hard push to legalize open carry in the state, perhaps these people are deliberately breaking the law as a protest to that end? In any case, it does boggle the mind. On Saturday, I had the pleasure of shooting one of these things. My brother borrowed it, as he’s been invited to go deer hunting during gun season this year, and he has no rifle of his own. Honestly, I don’t yet have a full-power rifle that I could use for such a purpose, so I would have to borrow something in his position. I’ve seen these guns before, but the elegance of them had escaped me until I actually had the opportunity to put one through its paces. I failed to get pictures of the individual gun in question, but it’s very simply an excellent, all-original example of its type. 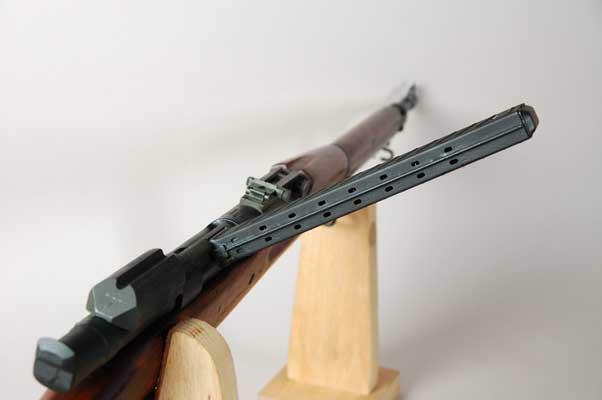 It even has the cutout for a Pedersen Device – which allows these guns to fire a smaller, 30-caliber cartridge in full-auto. But, such a device is not available to me, so we happily shot through a couple boxes of 30-06 instead. The rifle is fairly heavy, but well-balanced, and soaks up the heavy recoil quite nicely. I found that it is not so much a shoulder-pounder, but the muzzle does tend to flip quite a bit. The bolt and magazine were like clockwork, smooth operating within wonderfully tight tolerances. I would love to tell you that I made a dime-sized fuzzy hole in my paper target at 30-yards, but I cannot. If I spend a little real time with the rifle, I believe it’s capable of far better than that, but I had a hard time with the rear notch. I found it difficult to keep my focus on the front sight, as I should, and only got as good as about a 4-inch group with five shots. I suspect that an 03-A3 would suit me better, with it’s rear peep, but the notch would certainly be manageable with some good, hard practice. It appears that the price of these things will not be going down. The current going rate that I have seen starts just under $1000.00 and goes up from there, depending on the specific gun. Even so, I would recommend one to anyone that wants a nice shooting piece of history! Happy shooting, and be safe!